Prince Edward Island's Adam Casey booked his berth in the main draw of the Canadian men's curling championship with a 7-6 extra-end win over Yukon's Bob Smallwood. The Brier has become a young-er man's game. When Brad Jacobs and his Northern Ontario team won the Canadian men's championship two years ago with an average age of 29, they were considered the fresh faces of the sport. Now the skip of the reigning Olympic champions looks around the Scotiabank Saddledome and marvels at the youth movement in this year's Tim Hortons Brier. "It's a really young Brier," Jacobs observed. The average age of the field dropped further Saturday when Prince Edward Island's Adam Casey downed Yukon's Bob Smallwood 7-6 in an extra end of a qualifying game to get into the 12-team main event. Casey and Ontario's Mark Kean skip the youngest teams in the field with an average age of 24. "We're excited. Youth's good," Casey said. "We're an excitable group, but I think happy with the four guys. "I don't think we need any more experience to succeed here at this event. We've all learned in the past from our past skips and teams we've played on. I think we're willing to build on what we have." Casey is skipping P.E.I. for the first time at the national men's championship, but he's appeared in the last three throwing second stones for Brad Gushue of Newfoundland and Labrador. Gushue, Jacobs, Kean, Team Canada's John Morris, B.C. 's John Cotter and New Brunswick's Jeremy Mallais all opened 1-0 on Saturday with Saskatchewan's Steven Laycock at 1-1. Prime Minister Stephen Harper attended both draws Saturday. After securing his place in the main draw, Casey lost 8-7 to Kean to sit tied at 0-1 with Alberta's Kevin Koe, Quebec's Jean-Michel Menard and Jamie Koe of Northwest Territories. Manitoba's Reid Carruthers started with a pair of losses. Kean admitted feeling nervous during his first game because the Saturday night crowd was vocal. He was thankful he opened against the other young team in the field. "You don't want to start off against Brad Jacobs or one of the top guys right off the bat," the Ontario skip said. "It's nice to get your feet under you, make some shots. That was huge for us." B.C. 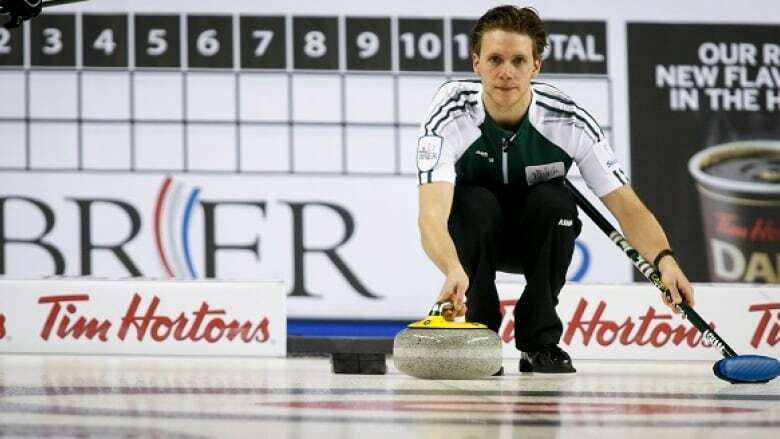 's Cotter edged Alberta's Kevin Koe 8-7 in an extra end, Saskatchewan's Laycock defeated Manitoba 7-4, and New Brunswick's Mallais got by Northwest Territories 6-5 in the evening draw.